A lightning storm that swept through Washington's Cascade Range and across Eastern Washington sparked dozens of fires Friday, including a blaze that was threatening as many as 50 homes in south-central Washington. Another wildfire in the north-central part of the state, near Grand Coulee, burned a summer home and several outbuildings while a separate blaze threatened several homes near Asotin, in southeast Washington. High winds, scorching triple-digit temperatures and low humidity hampered firefighters' efforts, but many fires were contained early. The National Weather Service issued a red-flag warning for high fire danger for all of Eastern Washington. Ninety firefighters were battling the McBee Command fire south of Kiona, about 20 miles west of the Tri-Cities; an airplane dropped retardant and a helicopter dropped water. The fire was estimated to have burned at least 6 square miles of tall grass and sagebrush, said Steve Sautter of the Benton County Emergency Management office. Between 40 and 50 houses were threatened but homeowners, initially told to evacuate, had mostly returned to help defend their property Friday night, Sautter said. No structures were reported damaged and the fire was 50 percent contained late Friday. Benton County declared a fire emergency, a move that brought state assistance. Sautter said another 175 to 200 firefighters would be arriving overnight from around the state. 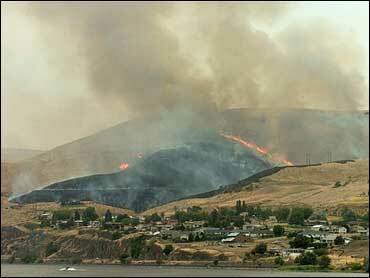 On a hillside near the town of Asotin, a wildfire threatened several homes Friday. An Asotin County sheriff's dispatcher said Friday night she had no details on the status of firefighting efforts and the fire command officer was out at the scene. Three fires had scorched about 6 square miles of native shrub-steppe habitat in the Hanford Reach National Monument near the Hanford nuclear reservation, while another two to three fires had burned about 3 square miles of the Columbia National Wildlife Refuge to the north. Near the border of Walla Walla and Columbia counties, firefighters were battling a 50-acre blaze that threatened some cabins on a ridge top. In northeast Washington, firefighters knocked down some 25-30 lightning-sparked blazes stretching from south of Spokane to the Canadian border, as well as in the Okanogan highlands, said Steve Harris of the state Department of Natural Resources. They ranged in size from one-tenth of an acre to 25 acres, though the biggest had burned mostly wheat. "They're all knocked down and not spreading," he said. "None of the fires got out of hand." No structures burned. About 60 firefighters from five agencies battled a 60-acre fire east of Grand Coulee, which burned three outbuildings, a summer home and a pickup, said Capt. Duane Frye of the Grand Coulee Police Department. Officials temporarily closed state Highway 174 to keep people out of the area. Authorities confirmed at least seven new fires were sparked by the lightning storm in Washington's Cascades. Four were believed to be burning in the Leavenworth Ranger District of the U.S. Forest Service, with a fourth in the Colockum area south of Wenatchee. Another fire was reported in the Glacier Peak Wilderness, past the community of Stehekin at the head of Lake Chelan, said Ken Frederick, acting public information officer for the Okanogan and Wenatchee National Forests. West of Yakima in the Naches Ranger District, lightning sparked a fire near Rock Creek, off of state Highway 410. The fire was burning in grass, brush and light timber, but no structures were threatened, said Ranger Randy Shepard. Fire officials were still monitoring for smoke in the forest, where fires can smolder for days after a lightning strike.